I use tabs for indentation in my python programs, but I would like to collaborate (using git) with people who use spaces instead. and all the python files will now have tabs instead of spaces. Edit: changed the forced checkout command. You should commit your work first, of course. 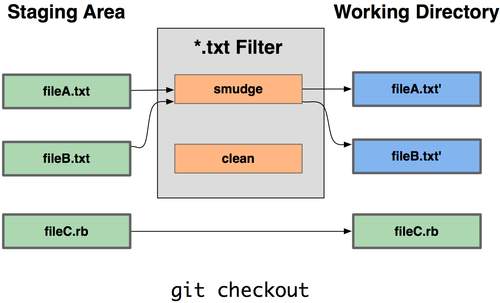 Yes, one potential solution is to use a git attribute filter driver (see also GitPro book), to define a smudge/clean mechanism. but when you check-in (and push and publish), those same files are stored back using only spaces. See Olivier's answer for a concrete working example of such a smudge/clean set of instructions. That way, when you finally push your work on github, it won't look silly in the code view with 8 space tabs which is default behavior in all browsers. That way you can work with normal tabs on 2 space indented projects. Of course you can write similar solution for converting from 4 space to 2 space which is the case if you want to contribute to projects published by me and you tend to use 2 spaces while developing. If you are on windows then you have a few extra steps to get @Olivier Verdier's solution to work. I renamed expand.exe to gexpand.exe as there is already a windows expand utility. Not the answer you're looking for? Browse other questions tagged git tabs indentation or ask your own question. Can git ignore a specific line? What's the easiest way to deal with project configuration files? How do I .gitignore and delete an already committed file without affecting other working copies?